Xue Tao was born around 786 A.D. in China during the Tang Dynasty, and died late in 831 (or in the next year). Xue Tao lived as an independent woman which was not easy nor common in this time. Xue Tao's portrait by Qiu Ying. Her father worked for the government. He died when she was a little girl. He may have given her some kind of literary education, including knowledge of how to compose poems. When her father died, her family sent her to one of the houses, a common punishment for families of criminals. There she met a lot of artists started to write poetry herself. Female entertainers in medieval China looked with contempt on the women who worked in “marketplace brothels”. Yet these women entertainers had guild and paid taxes to the government that regulated and protected them. Courtesans performed at public events and the town Chengdu was well-known for its entertainment district. At parties these women facilitated much of the social interaction of powerful and cultured men. After years of training in the arts, famous courtesans attached to the most prestigious houses. The men who associate with Xue Tao had one or more wives at home. 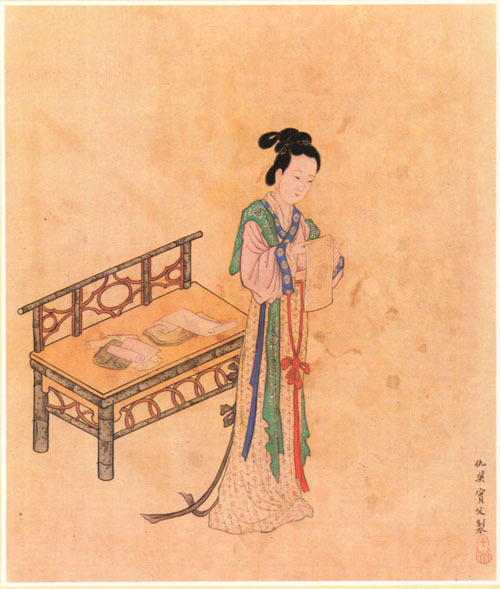 Xue´s work suggest that she often entertained important visitors to Chengdu by composing poems in their honor at parties. She was awarded the title “Collator”. In her early forties she met Yuan Zhen. This was the start of her relationship with him. Yuan Zhen is known for his poetry, his prose and his influence on the literary movements of the era. Yuan Zhen was ten years younger than Xue Tao. She might have left Chengdu to live for a time with Yuan, but this is not readily corroborated. It is also unclear if all of her poems was written for Yuan Zhen or for someone else, but it is said that she wrote poems for him. One of the poems is called “Sending old Poems to Yuan Zhen”. This must have been meant for him.